Jeremy Pruitt this last season led a Florida State defense that ranked first in the nation, allowing 12.1 points per game. 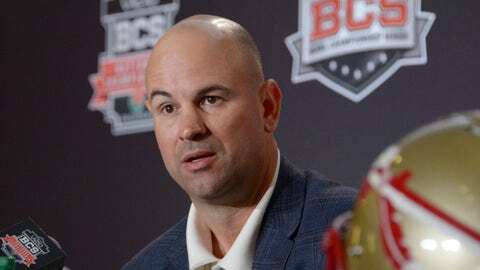 After leading a defense that helped Florida State claim a national championship, Jeremy Pruitt is leaving Tallahassee. Pruitt has been hired as Georgia’s defensive coordinator, replacing Todd Grantham, who Sunday left for the same position at Louisville. "I’m ecstatic," said coach Georgia coach Mark Richt. Pruitt, 39, will make $850,000 per year after drawing $500,000 at Florida State. That salary, which is exactly what Georgia was paying Grantham, puts Pruitt among the nation’s highest paid assistants based on 2012 total pay, trailing only Clemson’s Chad Morris ($1,309,650), Alabama’s Kirby Smart ($1,150,000), LSU’s John Chavis ($1,100,000) and Michigan’s Greg Mattison ($851,400). "This is an outstanding professional and personal opportunity," said Pruitt. "I’m looking forward to meeting the current players and getting on the road to visit with recruits." Pruitt spent just one season with the Seminoles, who ranked first nationally in points allowed (12.1) and against the pass (156.6 yards per game) and third in total defense (281.4). Richt is no doubt hoping he’ll have the same impact on the Bulldogs. Georgia finished 45th in the nation in total defense (375.5) and were 78th in scoring defense (29.0) in their fourth year in Grantham’s 3-4 alignment. Pruitt is no stranger to the SEC, having worked under Nick Saban at Alabama for six years before leaving for Florida State, including the last three as defensive backs coach. Coupled with championships with the Crimson Tide, Pruitt heads to Athens having been part of the last three national title team staffs.